Fox didn't understand the show, the suicide booths or Dr. Zoidberg. Where Billy got the voices for his characters. How hard it was to animate the martini glasses that Bender has. How hard it was to animate the conveyor belts in that same scene. Some of the animation wasn't up to scratch. How they make fun of New Jersey and how they were the first to bash it. How the episode resembles the odd couple. One of the designers was upset the nice chair was to be destroyed. Frames were cut from Amy's fall to make it quicker and more violent. The digital technologies used in the show and how it differs from traditional, hand coloured cells. Explanation on how and why Bender's neck is bent. Matt Groening wonders if anybody understands that owls are the new animal pests. New doors in Fry's room (Bender's closet) "come and go." Billy talks about how the closing credits are always squished into a 1" x 1" section on the screen. 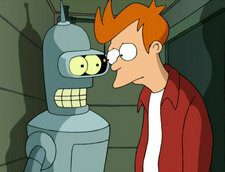 Matt Groening: This show got off to a rough start Fox thought it was too out of space so this brought it back to Earth. Unknown: This is when we first see Calculon, a moment in television history. David X. Cohen: I'm not gonna go into the full answer of this question, but the nerdiest, computeriest viewers out there might want to look up Bender's apartment number in the ASCII chart. David X. Cohen: The New Jersey bashing begins, resuming in episode 9, probably a few other ones here and there. Episode 8 also. Matt Groening: Can I admit something? I have never seen the Odd Couple. I really, I haven't. David X. Cohen: Oh really, you haven't? Well then we also made up that cigar joke that you're seeing. This page was last edited on 27 April 2011, at 20:10.